Are you preparing for the TOEFL? If so, you know how important it is to practice questions that are similar to those you’ll see on the actual exam. But, it can be hard to find quality (free!) materials to study with. That’s where this resource from our friends at Magoosh TOEFL comes in! 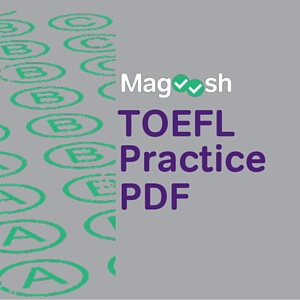 Magoosh has put together this 75-page TOEFL Practice PDF with questions from all four sections of the exam, as well as in-depth explanations and resources for further study. This PDF is free to download, so you can start studying right away. Click here to download your TOEFL Practice PDF! • What is a Good TOEFL Score?